Taste test: These are good pickle chips. These have a good, fairly mild dill pickle taste — it really tastes like a pickle. 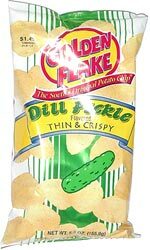 As their name indicates, they are thin and crispy, which is a nice change from some of the thicker gourmet pickle chips out there.